The Nextwave of barbarian warriors was invading Xanth from the north, ravaging and destroying as they advanced. But Mare Imbrium had her own problems. Ever since she had gained the half soul, the night mare had begun to mishandle her job of delivering bad dreams. Now the Night Stallion dismissed her, exiling her to the day world with a message for King Trent: "Beware the Horseman!" She had no idea of what that meant. But that was the way with prophetic warnings--nobody could understand them until it was too late. 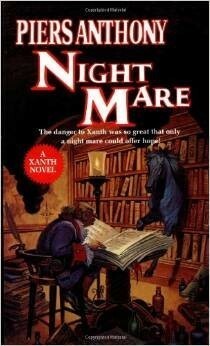 For the night mare, it began to be all a horrible nightmare!